When it comes to on-site amenities, we don't forget about our four-legged residents. All of our pet-friendly Springs luxury apartment communities include off-leash dog parks and pet spas where you can both have fun and get to know your neighbors. The only thing we ask is that our pet residents and their humans observe some basic guidelines of etiquette. Follow these simple rules and help us maintain the high quality of living at our Springs communities. You may know that Fido is a big softie at heart, but not everyone else does. Did you know that cynophobia, the scientific term for fear of dogs, ranks behind only snakes and spiders on the list of most common animal fears? Unless you're in the dog park, be sure to leash your pet whenever the two of you are outside your apartment. In addition, almost every city has leash laws, so don't put yourself at risk of a fine or other penalty. On the other hand, animal lovers can't resist approaching every dog they see. If your dog it timid, aloof or prefers to be left alone for whatever reason, there's nothing wrong with politely asking people to look but don't touch. It may be natural for dogs to do their business outdoors, but that doesn't mean everyone else has to deal with it. Be considerate and clean up after your dog at all times. Springs uses PooPrints™ pet waste management services with DNA testing to identify residents who ignore this simple courtesy, so you’ll be required to submit your pet’s DNA as part of your Springs agreement. 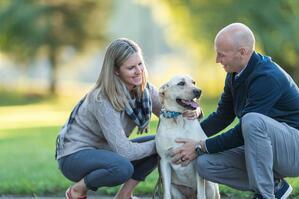 At Springs, registering your furry friend is an important requirement. By having your dog properly tagged, you can be assured that local shelters or animal control can reunite you in the event the two of you are ever separated. Your registration fee also helps fund those local shelters. It also helps our dedicated Springs service team because they can know whether they’ll encounter a pet when responding to service requests in your apartment home and can take any precautions to ensure your pet remains secure. The townhome style of our Springs luxury apartments insulates residents from noise, but an excitable dog can hit tones and levels that pierce the calm. If you have a hard time getting your pet to restrain himself, a professional dog trainer can be extremely helpful. We're happy to provide leash-free parks and pet spas for your convenience. Please respect the rights of others when using these amenities by treating neighbors and their pets with the same consideration that you would appreciate. For health and safety reasons, our sparkling resort-style pools are reserved for the use of our two-legged residents. Websites such as Pet Friendly Travel and Bring Fido have lists of dog-friendly beaches throughout the United States. Exercise is not just for health and weight control. Lack of physical activity for dogs can lead to excessive chewing and barking, anxiousness and other antisocial behavior. Plan daily activity for your dog, or enlist a friend, family member or professional dog walker if your schedule makes it difficult. Neglecting vaccinations puts your dog's health at risk while endangering the safety of other pets and residents in the community. Take your dog to the vet for regular visits and keep his vaccinations up-to-date. The cheerful members of our on-site management team will be happy to answer any questions you may have about our pet-friendly communities.